Another casino site with Vegas in the title, because there isn’t quite enough of them, Vegas Spins isn’t winning any awards for originality of design concept. Lots of neon and bright colours, flashy images, and everything else you’d expect from a site with this name, it’s all a little too predictable. But if you can sit past this and look deeper, Vegas Spins has quite a lot to offer players of all levels, including a nice selection of promotions and games. Cashback on a Sunday, Weekend Winning Streak from Thursday onwards, Free Spins, triple coins, and even a trip to Vegas can be won, meaning that there is always good reason to pop over to Vegas Spins and see what tantalising and tempting offers are waiting for you on any given day. 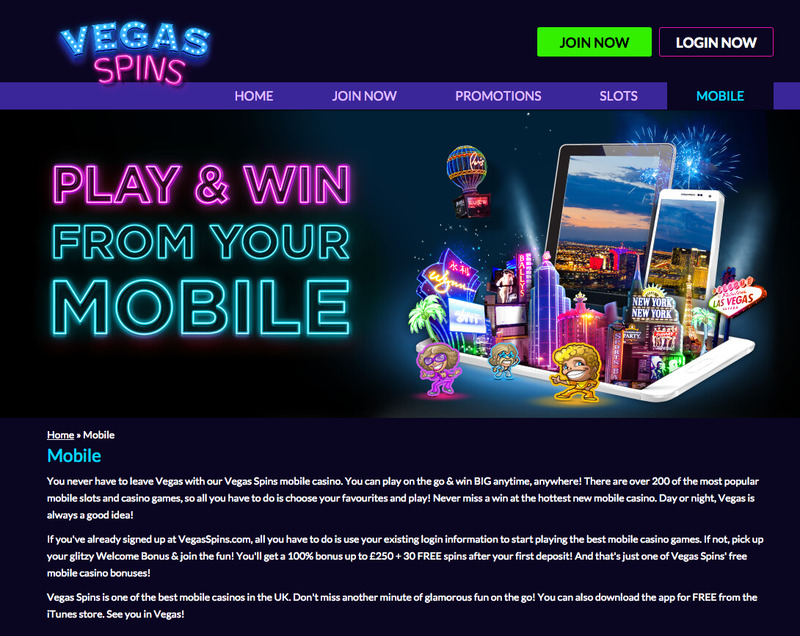 More and more sites are starting to capitalise on the previously overlooked mobile player market, and Vegas Spins is no different. Over 200 of their most popular games are easily accessible to mobile users. Desktop users have even more to choose from. Unsurprisingly, the main focus at Vegas Spins is on slots, and there is a hefty amount of them to try out. Shaman’s Dream, Cleopatra, Starburst, and many other classics are available here, so if you are looking for your favourite slot, you will almost definitely find it. With hundreds of slots to choose from, you are bound to find something new as well. There are so many slots available here, that it becomes a game in itself to see how many times you can press the ‘For more slots’ tab before they are all displayed on your screen. If slots aren’t your thing, Vegas Slots has you covered too, a bit at least. There isn’t a spectacular amount on offer, but there is a little bit of everything, Poker, Roulette, Keno, Baccarat, and a couple of Deal or no Deal themed casino games means that there are options. The casino games here are probably more suitable for those who are looking to take occasional breaks from slot play, more than those who don’t want to play slots. Vegas Spins is pretty much for the slots player, the other games feel like a token effort more than anything else, but with a huge amount of slots on offer, if this is your game type, then Vegas Slots is an excellent choice. If you can look past the painting-by-numbers design concept, then the gameplay options and promotions are enough to keep you coming back to this site for a long time. A very good site, and worth a try for any lover of slots.